The Minister of Labour and Employment, Dr Chris Ngige has declared that President Muhammadu Buhari is healthier than 80 percent of Nigerians. He also said that contrary to the believe that Buhari was too old for leadership, he was actually at the best age to offer mature leadership. Ngige, who spoke with journalists in Awka, Anambra State said older people make better leaders. He added that when Malaysia was in trouble politically and economically, it had to beckon on a 93 year-old , Dr Mahathir bin Mohamad to lead it as prime minister. On fears for the health of the president, he said, “That man (Buhari) you see there is healthier than 80 percent of Nigerians. “I’m a medical doctor, I can tell you authoritatively that he is healthier than most people who see his health as an issue. 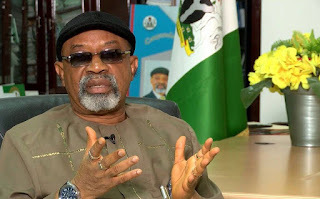 Ngige said Nigerians should count themselves blessed to have such personality as their leader, saying that age and experience were two indices the president had, that could not be found in those who were eyeing the presidential seat in the 2019 general elections. Speaking on the seeming marginalisation of the Igbo by the Buhari APC government, he said Ndigbo were the architect of their doom. “There’s nothing that is being shared by the Buhari government that is not equitably done. Buhari has five flagship projects; Lagos-Ibadan to Ilorin Mambila Power Plants; Abuja-Kaduna-Kano Highway; Second Niger Bridge and East West roads. “You can see how it was shared. So, how are you(Igbo) left out, why are you crying marginalization, why are you crying wolf when there is none and it is this mentality that I’m telling you people that you have to come out from. “So, all I’m saying in effect is that you(Igbo) must do political engineering; that’s the Igbos of the South East and the step to take forward is to support a Buhari presidency for 2019/2023 and vote for it with all their strengths.